You’re here because you’ve received a possession of marijuana ticket or been arrested for possession of marijuana. You’ve got questions. How can I beat my marijuana ticket? How can I fight my marijuana arrest?You’ve come to the right place. We can help you fight your possession of marijuana ticket and give you the best possible chance of beating your possession of marijuana charges. A possession of marijuana arrest is no laughing matter. Marijuana remains illegal in the State of Georgia and a possession of marijuana conviction has far reaching penalties beyond even those laid out in the Official Code of Georgia, including an automatic license suspension for a guilty plea. Marijuana Possession Defense lawyer Sean Goldstein represents the presumed innocent in metro Atlanta charged with possession of marijuana. Impact of a Possession of Marijuana Conviction: If convicted of marijuana possession, you face jail or probation and steep fines. However, a marijuana possession conviction has an impact far beyond that. If convicted of marijuana possession, your license will be suspended. In addition, a marijuana possession arrest or conviction will leave a permanent stain on your criminal record. Marijuana can lead to problems with employment, obtaining or maintaining a professional license, student loans, and government assistance with housing. How can possession of marijuana lawyer Sean Goldstein help fight my possession of marijuana charges? A possession of marijuana defense lawyer can assess the evidence against you and give you best chance of beating your marijuana arrest or ticket. Only by doing this can you get the best possible result in your possession of marijuana case. The first step in fighting your marijuana ticket is to determine if the State has the right to arrest or search you for marijuana. Even if you were arrested for possession of marijuana, that does not mean the State had the legal right. It’s possible your marijuana arrest or search was illegal and the case could be dismissed. Only a trained possession of marijuana defense lawyer like Sean Goldstein can assess your marijuana arrest or search and determine if the arrest was legal. The next step in fighting your marijuana possession charges or ticket is to determine if the State as enough evidence to convict. The State might not be able to establish your possession of the marijuana, or might not be able to identify the marijuana chemically. Possession of marijuana defense attorney Sean Goldstein knows how to attack the evidence to give you the best chance of beating your marijuana possession ticket. Even if the State did have the right to arrest you for possession of marijuana and and has enough evidence to convict you of possession of marijuana, marijuana defense lawyer Sean Goldstein may be able to keep the conviction from going on your permanent criminal record. Your possession of marijuana charges might be able to be resolved by using conditional discharge, first offender, or entry into a pretrial diversion program. These programs could help you avoid a possession of marijuana conviction, license suspension, and even allow you to keep the arrest off of your criminal record. 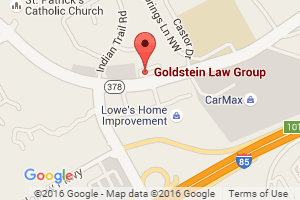 Contact Goldstein Law Group LLC online or at 678-757-5529 to schedule your free initial consultation. Sean Goldstein is an experienced possession of marijuana defense attorney that can help you fight your marijuana arrest.